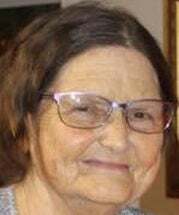 Johnnie Mae Fritts, 74, of Lenoir City, passed away April 10, 2019. Johnnie was a loving wife, mother and grandmother. She was an owner and operator of West Hills Market and Bob’s Market and Deli in Lenoir City. Johnnie was also a former employee of Walmart in Lenoir City. She was preceded in death by her parents, Samuel McNabb and Inez McNabb. She is survived by her husband of 56 years, Bobby Fritts; children, Bobby Joe Fritts Jr. (Vicki) and William “Billy” Nathaniel Fritts; grandchildren, Eric Thorne Fritts (Jessica), Joshua Nathaniel Fritts and Shayla Renea Fritts; brothers, James McNabb (Nellie) and Sam McNabb and wife, Kathleen “Tootie”; and many nieces and nephews. The family received friends Saturday, April 14, at Click Funeral Home in Lenoir City. Funeral services followed in the Click Funeral Home chapel. Family and friends gathered Sunday at Loudon County Memorial Gardens for graveside services. In lieu of flowers, donations may be made to the funeral home to help with expenses.